Make a style statement in your home, be it contemporary or traditional, with our Wide Shelf Ladder. With shelves of varying depths, our Wide Shelf Ladder is exceptionally versatile, making it perfect for using as a rustic bookcase, creating a plant display or showcasing objets d'art. Crafted from spruce, its natural charm would find a home in any room in the house or why not use it to create a potted herb garden outside or in the conservatory? Reinvent traditional storage space with endless looks from this upcycled chic shelf ladder. 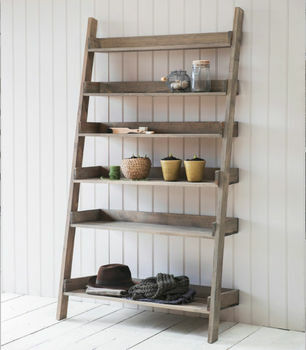 Please note that this shelf ladder has a raw rustic finish which we think all adds to the charm. You can of course sand it down if you’d prefer a smoother effect. The distance between each shelf is 27cm.